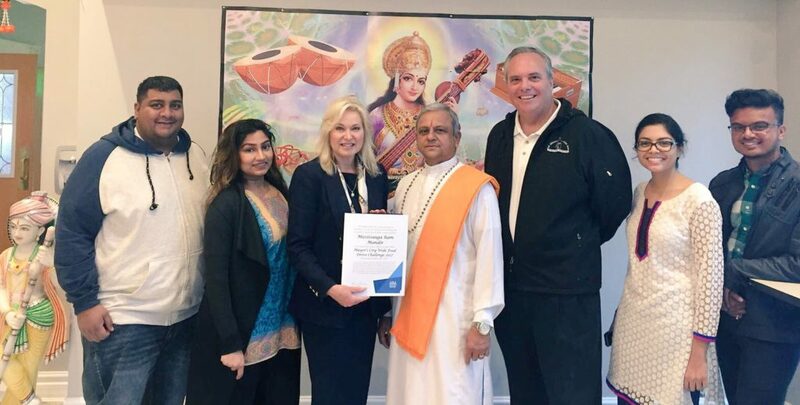 Mayor Crombie joins Pandit Roopnauth Sharma, founder and Spiritual Leader of Mississauga’s Ram Mandir; Chris Hatch, Executive Director of The Mississauga Food Bank, and members of the broader Ram Mandir community for the official collection of funds and food to The Mississauga Food Bank. On behalf of everyone involved in the 2017 Mayor’s City-Wide Food Drive, we want to thank the vibrant, active and engaged faith community from Ram Mandir for generously raising $1,000 and 1,250 pounds of food toward this year’s Thanksgiving campaign, Mayor Bonnie Crombie said. Shri Ram Mandir, located in Mississauga, is one of Canada’s leading Hindu temples. Mayor Crombie would like to extend an invitation to you to join her at the 2017 Mayor’s Citywide Food Drive campaign wrap and results announcement on Wednesday, October 18th at 4:00 PM.